Does Trump Know India Sends More Illegals Than Mexico to US? Does Donald Trump, the anti-immigration Republican presidential candidate, know that India is now the biggest source of illegal immigrants entering the United States? US visa is the most sought after visa in India. Those who get it celebrate with billboards. Those who don't find human smugglers to smuggle them into the United States. 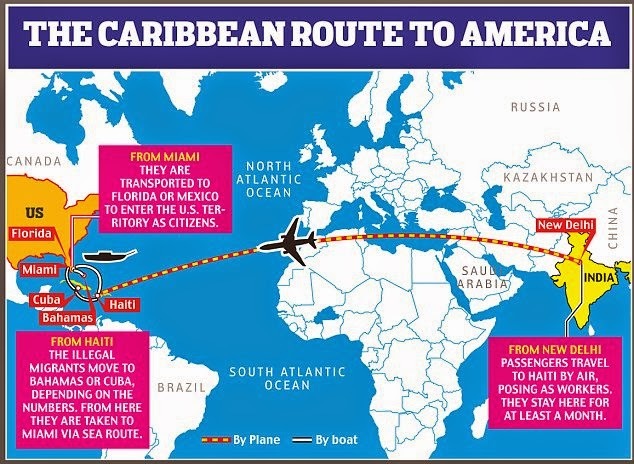 The preferred routes for illegal entry from India are through the Caribbean and Central America. The number of unauthorized immigrants born in India grew by about 130,000 from 2009 to 2014, to an estimated 500,000. Many unauthorized immigrants from these nations arrived with legal status and overstayed their visas, according to Department of Homeland Security statistics. Homeland Security Secretary Jeh Johnson said recently that his agency is “doubling down” on preventing immigrants from Africa, the Middle East and other parts of the world from crossing illegally at the southwest border, according to the Pew Research Report. From 2009 to 2014, Pew estimates that the number of undocumented Indian immigrants in the U.S. exploded by 43% to a total of around 500,000. During the same period, the number of unauthorized Mexicans fell 8% to 5.85 million, according to a report in the Wall Street Journal. 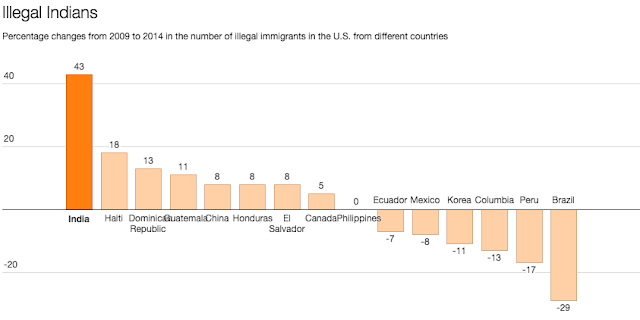 Looking at the total arrivals including legal and illegal immigrants, India and China are each sending more people to the United States in recent years than any other country. In 2014 about 136,000 people came to the U.S. from India, about 128,000 from China and about 123,000 from Mexico, census figures show. As recently as 2005, Mexico sent more than 10 times as many people to the U.S. as China, and more than six times as many as India, according to the WSJ story. Will Donald Trump and his fellow anti-immigration campaigners take note of the changing picture of illegal immigration into the United States? Will they stop bashing Mexicans and Muslims? So, on April 8, 2014, the Punjabis at Texas’s El Paso Processing Center went on a hunger strike. It was about a week later when Singh, feeling shaky on his feet, walked into the meeting room where the visitor was waiting. He was startled to see a short, rotund man in a turban with his beard tied underneath his chin: a fellow Sikh from the Indian consulate in Houston. He was there to offer to send the detainees home. Illegal Indian immigrants in the U.S. could be among the worst affected if Donald Trump implements harsh anti-immigration measures as the next President, says a recent study. A report from the Latin American Social Sciences Institute, Mexico, has concluded that one-third of all Asian illegal immigrants who were detected while attempting to enter the U.S., between 2007 and 2015, were from India. A total of 2,450 illegal Indian immigrants were apprehended by Mexican authorities before they reached the Mexico-U.S. border near the state of Texas, the study states. But in many cases, the detained illegal immigrants were let off as Mexican laws are ill-equipped to deal with the influx. Prof. Rodolfo Cassilas, the author of the report, told The Hindu that Mr. Trump’s anti-immigration plans are radical and need greater international attention as they can potentially trigger a new kind of international crisis. The trend of smuggling Asian nationals through Mexican border has been well established for the past few decades, said Mr. Cassilas. But Mexican society is now better informed and demands for stricter laws are growing also in Mexico, he added. The public at large in Mexico learnt about Indians using their country as a transit route to the U.S. in 2010 when a drug cartel on Mexico-U.S. border killed 72 immigrants over an evident payments issue. “One out of the 72 killed was from India and that is when the international dimension connecting South Asia with Central Asia became clear to the masses, but the government has not so far openly discussed the Asian dimension,” Mr Casillas said. “That illegal immigrants from India and the rest of South Asia in general reaching the U.S. shows coordination among transnational human traffickers located in Central America, Asia and the U.S. They can also move other things, drugs for example,” Mr. Casillas said. Both Mexico and the U.S. are aware of the utility that human traffickers have for serving other criminal network. “For that, undocumented immigrants are so important for both Mexico and the U.S.,” Mr. Casillas said, explaining that the argument of greater security might be used to take anti-immigrant measures in the U.S. if Mr. Trump’s plan to become the U.S. President comes true. On a recent Friday night in Phoenix, an unmarked white Department of Homeland Security bus pulls up to a curb near the Greyhound bus station. The door swings open and 15 young men and women from India step off. In the scorching summer heat, they climb into waiting cars and taxis, cramming as many passengers inside as possible before they are driven off into the night. A half-hour later, a second DHS bus pulls up to the same spot. Twenty Indians climb into cars and taxis, and like the first group, speed off. This scene is repeated almost nightly at the Greyhound bus station on Buckeye Road and 24th Street near Phoenix Sky Harbor International Airport. The Indians are part of a mysterious surge in migrants from the South Asian country showing up at the Arizona border without legal visas and then requesting asylum to remain permanently in the U.S. out of fear they may be persecuted if returned to their homeland. They arrive after paying as much as $35,000 to be smuggled halfway around the globe, flying from India to Central America and then embarking on an arduous and often dangerous 3,000-mile journey through several countries, including Mexico, to reach Arizona. Hundreds, and perhaps thousands, of Indians over the past year have asked for asylum. Some have been caught crossing illegally by the Border Patrol. More often, they are simply turning themselves in at legal border crossings in Nogales, asking for asylum based on claims of political persecution. While the Indians say they are fleeing persecution, however, some skeptics say they are more likely fleeing poverty. “They are going to have a hard time paying off smuggling debts, and that could put them in a forced labor situation,” said Elizabeth Chatham, a Phoenix lawyer who chairs the Arizona chapter of the American Immigration Lawyers Association. Some border-security advocates, meanwhile, are concerned that the same criminal smuggling gangs being used by Indians to get to the U.S. could also become pipelines for terrorists. “They will smuggle anyone who pays them,” said Jessica Vaughan, director of policy studies at the Center for Immigration Studies, a Washington, D.C., think tank. On a nightly basis, as many as two dozen Indians who have managed to establish so-called “credible fear” of persecution during hearings with U.S. immigration asylum officers are being set free at the bus station. Before their release, they are given notices to appear in immigration court at a future date, when a judge will decide whether to grant asylum. In addition to the many hundreds who have already been released, hundreds more remain in detention centers in Eloy and Florence waiting for credible-fear hearings. It is unclear, however, whether those asking for asylum are legitimately fleeing persecution and whether they intend to show up for their asylum hearings. In fiscal year 2012, nearly 10 percent of Indian asylum seekers failed to show up for their final asylum hearings in U.S. immigration courts nationwide, according to the Department of Justice. Some experts fear they are fleeing poverty in India, the world’s largest democracy with 1.2 billion people, to seek better economic opportunities in the U.S. In that case, they would most likely skip out on their court hearings so they can remain in the U.S. and work here illegally. Police wearing berets and bulletproof vests broke down the door of a Guatemala City apartment in February hunting for illegal drugs. Instead, they found a different kind of illicit shipment: 27 immigrants from India packed into two locked rooms. "Being the businessmen they are, they need to start looking for ways to supplement that work," said Rosendo Hinojosa, chief of the U.S. Border Patrol's Rio Grande Valley Sector, at the southernmost tip of Texas, which is the most active nationwide for apprehending Indian nationals. The influx has been so pronounced that in May, Homeland Security Secretary Janet Napolitano told a Senate committee that at some point this year, Indians will account for about 1 in 3 non-Mexican illegal immigrants caught in Texas. Most of the border-jumpers are seeking jobs, even though India's economy is growing at about 9 percent per year. Once safely inside the U.S., they fan out across the country, often relying on relatives who are already here to arrange jobs and housing. Indians have flooded into Texas in part because U.S. authorities have cracked down on the traditional ways they used to come here, such as entering through airports with student or work visas. The tougher enforcement has made it harder for immigrants to use visas listing non-existent universities or phantom companies. Also contributing to the spike was a quiet change in travel requirements in Guatemala, El Salvador, Nicaragua and Honduras. Beginning in 2009, those nations sought to attract investors by allowing visitors from India to enter without visas. Mexican authorities have been unable to stop smugglers from moving illegal Indian immigrants over their country's southern border, then north to Texas. Instead, Mexico asked neighboring Guatemala to restore the visa requirement for Indians, which it did June 6. Still, the lack of a visa requirement allowed at least 8,300 Indians to enter Guatemala and fewer than 28 percent of them exited legally, according to Enrique Degenhart, director of Guatemalan immigration. The others disappeared to continue heading north. Indeed, the group of Indians police discovered in Guatemala City eventually went free because, at the time, they were in Guatemala legally. Meanwhile, El Salvador, Nicaragua and Honduras still don't require visas for Indians, meaning smugglers can shift routes and use those countries as alternate jumping-off points for the journey north. DONALD TRUMP HAS deep ties to India’s right-wing, anti-Muslim Bharatiya Janata Party. And Shalabh “Shalli” Kumar, known as a close Modi ally and the BJP’s consigliere in U.S. politics, has emerged as a prominent backer of Trump’s candidacy. Kumar has organized multiple fundraising efforts within the Indian American community for Trump and donated $898,800 to Trump Victory, the joint fundraising committee formed to support his presidential campaign. Trump is also in business with a prominent BJP politician, having signed a licensing deal in 2014 to construct the Trump Tower Mumbai with Mangal Prabhat Lodha, a real estate mogul and BJP state legislator. The 75-story building is now under construction, scheduled to be completed in 2018. In many ways the partnership could not be more perfect. Like Trump, the BJP rose to power nationally two years ago by playing on sectarian anger against Muslims. But Trump’s partnership with Lodha may present political complications. Lodha, like many BJP politicians, has not only antagonized Muslims, but has also repeatedly played to local anti-Christian hostility and sponsored legislation that Christian leaders say is designed to single them out for discrimination. Neither Trump’s campaign nor Lodha’s firm responded to a request for comment. In 2014, announcing the Trump Tower Mumbai deal, Trump praised his partner, calling the Mumbai-based firm “a truly fantastic team of professionals.” Lodha’s son, the managing director of the Lodha Group, told the New York Times that the branded approach to real estate has help him sell condominiums; units in Trump Tower Mumbai have already sold for as much as $2 million. Lodha came to political power in Mumbai in 1994 as Hindu activists protested over claims that Christian missionaries were entering slums and converting low-caste Hindus. In one incident, BJP activists attacked Christian converts over a dispute in Dharavi, a Mumbai slum. In another local incident, Hindus attacked a Catholic convent after accusing the school of converting a Hindu student to Christianity. Skirmishes between Christians and Muslims led to BJP activists taking to the streets to demand anti-conversion laws. The Indian police have managed to uncover a huge tax scam where a large number of Americans were duped of millions of dollars by people posing as tax authorities and asking for the payment of unpaid taxes. Seventy people have been arrested as of Thursday, and hundreds questioned in relation with the fraud, a Mumbai police officer said. The scam ran for almost a year, the Indian police told the Associated Press (AP). Fake call centers were used to voice mail messages to U.S. nationals, telling them to call back regarding the back taxes they owed. When any of these people did call back, the scammers would manage to take out thousands of dollars from them to “settle” the tax cases. “They would make threatening calls to honest taxpayers in the U.S., ask them to deposit money through pre-paid cards,” Param Bir Singh, the police chief of Thane, a Mumbai suburb, told Indian news network NDTV. According to Mumbai police officer Parag Marere, the elaborate plan brought in more than $150,000 a day — possibly amounting to almost $55 million in the one year the scam ran. “We are questioning those who were involved in the fraud, including those posing as tax investigators,” Marere said, according to the AP. Of the 600 or more people being questioned, many are expected to face charges for running the fake call centers, the police said. They include alleged leaders of the scam, as well as those associated with other tasks within the fraudulent enterprise that ran out of several stories in a Mumbai office building. The criminal charges filed against those involved include extortion, impersonation and violations of the country’s information technology laws, the AP reported. Indian media reported that the scam involved collaborators based out of the United States as well. At least one company in the U.S. reportedly supplied the Mumbai call centers with personal information of those targeted by the scam. Almost 70 percent of the money made stayed in India, while the remaining was shared with those based outside the country. In police raids this week, hundreds of hard disks, high-end servers and other electronic equipment were seized from the offices of the fake call centers. If only he were talking about brilliant scientists, toiling away at some of the world’s most intractable issues, he might actually have a point. This year, every American who won a Nobel prize in a scientific field was an immigrant. Last night, the Republican Hindu Coalition in New Jersey held a charity event titled “Humanity United Against Terror”, with Donald Trump as the chief guest. The fliers were handed out to all attendees, and accused Clinton of colluding with Gandhi to organise a “witch hunt” against Modi. 3. Posters of Trump photoshopped on a lotus, the BJP’s official party symbol, adorned the arena. This, despite one of the Trump campaign’s main focuses being a push for tighter immigration laws. 5. It wasn’t all hunky-dory though, with anti-Trump groups protesting outside the venue even as the event began. 6. The highlight of the night was a performance involving Indian dancers being attacked by terrorists with lightsaber-y guns, and being saved by the U.S. army. 9. Trump began by proclaiming that he was “a big fan of Hindu”. His odd phrasing didn’t go unnoticed. “For all of the people in Mumbai, the attack on the parliament was outrageous and terrible. We will defeat radical Islamic terrorism,” he misspoke. 2. He capped off the night by asserting that India and America would be “best friends” under his administration. In India ethnic nationalism, never far beneath the surface, is worryingly resurgent. Since 2014 the country has been ruled by Narendra Modi of the Hindu-nationalist Bharatiya Janata Party (BJP). The party seeks to distance itself from radical Hindutva (Hindu nationalist) groups, which criticise it as “soft” on Pakistan, Muslims and those who harm cows (which are sacred to Hindus). And Mr Modi is urbane, pro-business and friendly towards the West. But he is also a lifelong member of the RSS (National Volunteer Organisation), a 5m-strong Hindu group founded in 1925 and modelled loosely on the Boy Scouts. Members of the RSS parade in khaki uniforms, do physical jerks in the morning, help old ladies cross the street, pick up litter—and are occasional recruits for extremist groups that beat up left-wing students. And last year Mr Modi’s minister of culture, Mahesh Sharma, said that a former president was a patriot “despite being a Muslim”. The minister remains in his job. Hindutva purports to represent all Hindus, who are four-fifths of India’s population. It promises a national rebirth, a return to an idealised past and the retrieval of an “authentic” native identity. Its adherents see themselves as honest folk fighting corrupt cosmopolitans. They have changed India’s political language, deriding “political correctness”, and calling critical journalists “presstitutes” and political opponents “anti-national”. The RSS also exerts huge sway over education and the media. Some states and schools have adopted textbooks written by RSS scholars that play up the role of Hindutva leaders and marginalise more secular ones. The BJP has made a big push to control the judiciary by changing rules for appointments, but has met strong resistance. It does not control most states in the east and south. Many of the educated elite despise it. And banging on too much about Hinduism and not enough about the economy is thought to have cost it a state election in Bihar last year. During a meeting with border patrol officials on Thursday, President Donald Trump appeared to imply that Pakistan is in the Middle East despite the fact that the nuclear-armed country and occasional U.S. ally is in South Asia. During the meeting, a border official from South Texas told Trump that officials had apprehended two Pakistanis at the border on Wednesday. “Yesterday we had 450 apprehensions, Mr. President. Out of that, 133 from countries other than the Central American countries and Mexico. India, we apprehended some Pakistanis, some from Romania, on and on and on,” the border official told Trump. “How many Pakistanis?” Trump asked. “Two yesterday,” the border official replied. “So far this sector has apprehended folks from 41 different countries. Just yesterday we apprehended 133 people from countries other than Central America and Mexico. That includes individuals from India, China, Pakistan, Romania, Ecuador, Nicaragua, on and on and on,” the border guard reiterated, this time addressing the cameras. “So they apprehended people from the Middle East and they do it all the time,” Trump said, apparently unaware that none of the countries listed by the border guard are in the Middle East. The current partial government shutdown, which has been ongoing for over 20 days, could soon be the longest in U.S. history. Trump says he plans to continue with the shutdown until Congress agrees to fund a wall on the border for around $5 billion. Trump had claimed during his campaign that Mexico would pay for his proposed border wall. In recent days, the president has said that, if he does not get his way with Congress, he is strongly considering the possibility of declaring a national emergency over the issue, which would theoretically allow him to authorize the construction deemed necessary for national defense and security. Some analysts have suggested that Trump could use laws that allow the U.S. military to undertake construction projects using money that has already been appropriated for the military, which would mean redirecting funds that have been earmarked for Army projects. Meanwhile, around 800,000 federal employees are currently furloughed or working without pay until the government reopens. Trump has previously singled out Pakistan and accused it of harboring terrorists, but the country appeared to be off of his radar for the past year. The president started 2018 by slamming Pakistan for providing safe harbor to the Taliban and slashed U.S. assistance to the country. Since then, however, he has remained quiet on the issue. Secretary of State Mike Pompeo traveled to Pakistan in September, where he held high-level meetings with the country’s new prime minister, Imran Khan.